The new Mass Effect game is big, sprawling, and a little intimidating. It’s also needlessly complicated and oddly frustrating in places. Nevertheless, I can’t stop playing it. Allow me to try and figure out why. When I wrote for Kotaku, I played games much faster, so as to better plumb their depths and come up with observations and angles for articles. I’m playing Mass Effect: Andromeda much more slowly now, metaphorically sliding my finger across its textures like it’s a pair of jeans I might want to return. Since I’m playing a review copy provided by EA, that’s not really the issue. What I’ve been struggling with is trying to locate exactly where my pleasure is coming from with this game and why it, in general, feels so fleeting. 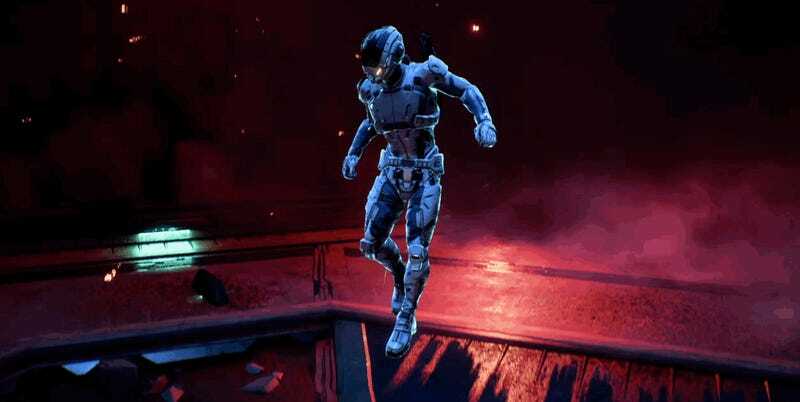 Mass Effect: Andromeda places players in the role of a paramilitary explorer astronaut named Ryder. The Ryder character is a customizable avatar like the Commander Shepard of older Mass Effect games. He or she serves as the Pathfinder, a sort of hybrid ambassador/soldier/engineer who works to help the Andromeda Initiative find new home planets for Milky Way native lifeforms. My prior experience with the older Mass Effect games complicates my feelings towards Andromeda. While I like the way my Shepard looked in Mass Effect 3, I was really pumped to see how a new game engine would improve character customization. Maybe I’d finally be able to replicate my all-too-normal but woefully underrepresented hair style in this one. But a few minutes in the customization menus dashed those hopes. However, not liking the way my player character looks is the least of my problems. Previous Mass Effect titles happened in an already ordered corner of the universe. The allegiances, factions, and infrastructure in the Milky Way were already there by the time the Reapers arrived. In Andromeda, there are still new vistas to be trod upon and new mysteries to investigate. But, so far, this game’s thematic ambitions, narrative scripting, and design mechanics don’t gel together. In terms of progress, over the course of 15-20 hours or so, I’ve gathered the full squad and have managed to secure an alliance with a new race called the Angara. Andromeda’s presented me with a reverse-polarity Mass Effect experience. I’m enjoying things I wasn’t expecting to like, specifically the combat. Combat used to be obligatory drudgery required to get to the juicy drama of a Mass Effect game’s story. This time around, the skirmishes and big multi-point raids simmer with great moment-to-moment tension. Conversely, I’m grumbling at elements I thought I’d be eager to play through, like sidequests and top-level exploration. For example, planet scanning has changed to become more shallow. In Mass Effect 3, you’d pull into a star system, turn the telemetry towards a new celestial body and wait to be surprised. In Andromeda, once you’re in the orbits of a new system, shipmate Suvi tells you whether or not there’s something to find, which doesn’t feel quite as compelling. There’s still an element of surprise but a buffered one. There’s a loop of exploration, resource-gathering, and crafting in Andromeda that involves scanning new technologies, setting up outposts, and scrounging up minerals and resources. Much of this activity increases the viability of each planet for settlement and gives Ryder in-game currencies to improve various attributes. It’s a common element in RPG-based games but Andromeda makes you wade through a maze of menus—which don’t link together satisfyingly—to figure out upgrade options. Unfortunately, there’s no way to pin a crafting recipe where I can handily see it, so trying to remember what I need to gather to make, say, a new shotgun means I’m constantly bouncing between different menus, some of which I can only access at certain nodes. This kind of clunkiness is pervasive throughout the game’s UI and weighs down the play experience a lot. Those issues aside, I do like that the subtext of Andromeda is about first-encounter statecraft, infrastructure, and nation-building. You’re essentially crafting the infrastructure for an ostensibly better version of human potentiality in a new galaxy. In that way, it calls back to classic space operas, especially in how it tries to be mindful of the politics of colonization. Unfortunately, most of those ideas play out in busywork sidequests designed to flick you around the landscapes of the various planets. There’s a meter that measures how your actions increase the viability of each planet but the progress isn’t palpable; it’s more of something that you see rather than feel. When I got the ice planet of Voeld to 100 percent viability, the environments didn’t feel that different. There were clusters of buildings and people where there were none before, but it wasn’t enough to make the game’s world feel more alive. I have a similar gripe with the lack of payoff between sidequests and the main story campaign. I find myself doing sidequests because I don’t want to miss out on their possible repercussions on the larger plotline. Sometimes I got new weapons and resources at the end of them, but everything still felt disjointed, strung together without the right kind of connective tissue to make the experience feel cohesive. When I embarked on the loyalty mission for new character Jaal, I was pumped to finally dig into the signature melodrama that Mass Effect games are supposed to deliver. But after the first chapter of that questline, I was told to wait for a message from another non-playable character—a nudge to go do something else—and that drained any excitement or sense of flow I had. So far, too much of this game feels like obligation and too little of it feels like something I have a yearning to finish. None of the side missions have generated dramatic aftershocks and I forget about them as soon as they’re done. There are good culture-clash plot beats when Ryder initially meets the Angara; bystanders regard him with suspicion and distrust; prejudice against humans is openly displayed. But the diffuse design of the game shoves that element in the background, as the game clamors for you to bang around the various planets looking for lost things for people you don’t really know. It’s supposed to feel like you’re making history in Andromeda, but, in fact, it doesn’t feel like it. By my guess, I’m only about a third of the way through the story campaign and the first major patch of the game has hit, so things may yet change by the time I finish. Right now, it’s feeling like the level of sophistication hasn’t risen as much as I’d hoped it would since the last Mass Effect games came out. 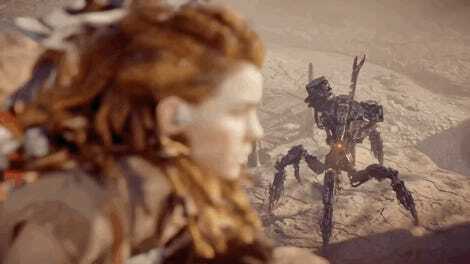 Horizon Zero Dawn was the last big-deal video game I played before Mass Effect: Andromeda, and I liked it because it wove familiar genre tropes and game mechanics into something that felt fresh and uniquely its own. There was mystery and wonder seeded throughout the gameworld and, like Rise of the Tomb Raider, I felt I needed to enter into a symbiotic relationship with the landscapes to survive. I’m not feeling that with Mass Effect: Andromeda yet. I’ll write more about the game if that changes by the time I finish—and I hope it does.